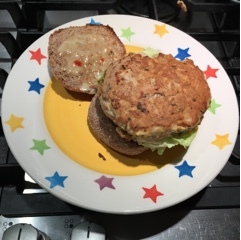 This is a yummy tuna burger. Add as much or as little chilli as you like depending on your tolerance. Lovely Asian flavours. Put the tuna in a food processor and whizz until quite finely chopped but not pureed. Mix the salmon with the egg, lime zest, ginger, coriander and chilli. Shape into 2 large flat burgers. Heat a frying pan over a medium heat and add a little oil. Add the burgers and cook for 4-5 mins per side. While the burgers are cooking, mix together the mayonnaise, chilli sauce and lemon juice. Lightly toast the bun and spread the sweet chilli mayo on both halves. Top with the tuna burger nd some lettuce and serve.